What do we really know about the Quran? 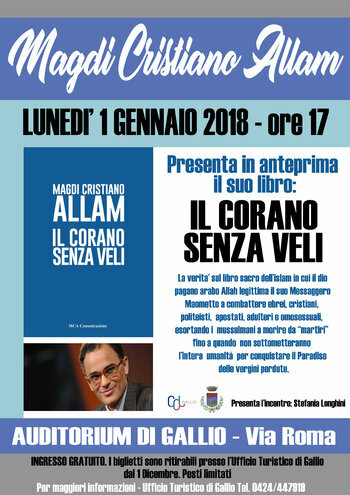 Monday, 1 January 2018, the author and columnist Magdi Cristiano Allam will preview his new book "the Koran unveiled", trying to shed light on the sacred book of islam, in which the Arab Pagan God Allah legitimate his Messenger Muhammad to fight Jews, Christians, polytheists, apostates, Adulterers and homosexuals, exhorting Muslims to die as "martyrs", until they submit all humanity to conquer the paradise of lost Virgin. The meeting to discover the sacred book of Muslims will take place at theAuditorium of Galliumon theAsiago plateau at 17.00hours, and will be presented by the journalist Stefania Longhini. Tickets are collected at the Tourist Office of gallium from 1 December. Limited seats. For more information contact the Tourist Office of gallium by pressing the buttons below.